But it’s a bait-and-switch (which he admits halfway through). He likes mega-churches and, by his writing (in this and other pieces I’ve read), would probably like to lead one or build one. A good thing about mega-churches? They have a lot of resources to do a lot of good in the world (should they choose to). The consolidation of people and money under one mega-roof creates mega-possiblities (a quick qualifier: if one does some math to subtract the ecological and sociological impact from a mega-building, mega-pastors, mega-salaries, mega-parking lots, and mega-messaging-machines that often tout a message that I’d consider more damaging than helpful, the possible good shrinks considerably). 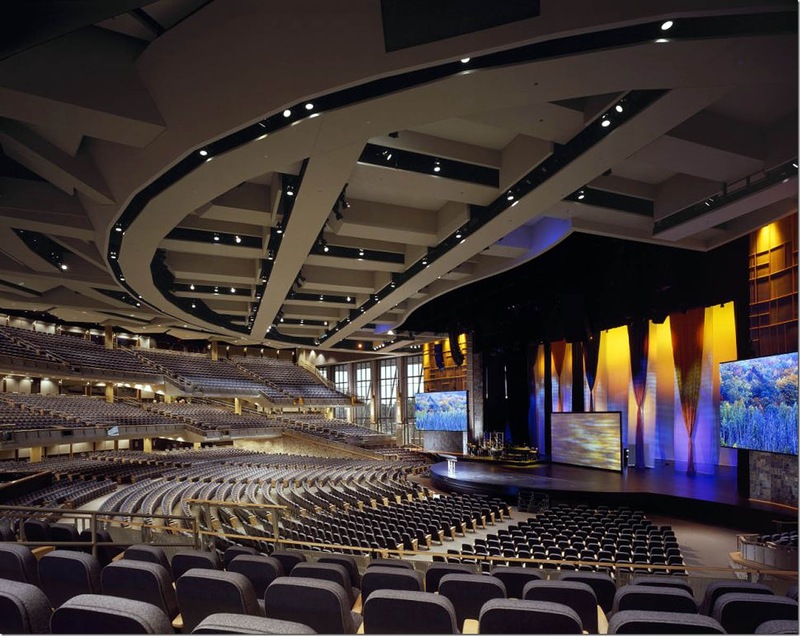 A bad thing about mega-churches? No, seriously, I think that’s a bad thing. The anonymity that’s possible by slipping into stadium seating creates this wonderful silo-effect for the participant. It makes you feel like the mega-speaker in the mega-space is speaking directly to you…and yet you never actually interact. And there’s no need to! You have thousands of others around you who can take up their time. Why should you? Also, I imagine it’s a little difficult to talk about giving yourself up for your neighbor when you’re sitting on a building whose footprint is effectively the size of a neighborhood. Can we talk about the God who empties for the sake of humanity if we’re looking to fill our lives with mega? Is there no cognitive dissonance there? And, from my office, another problem with mega-churches is that it’s mega-taxing as a pastor to care for so many people…so, often you don’t. It doesn’t happen. The voice of Sunday morning is not the voice of the hospital or home visit. That’s not always bad, mind you. Lots of people can and should do such care. But there’s something about knowing the people you’re serving, and knowing them well. Listen, I feel taxed enough keeping 300 people’s issues, concerns, schedules, and needs clear in my head. The possibility of 10,000 people sends me into convulsions. Another problem I have with mega-churches is that I think mega-churches teach, implicitly or explicitly, that mega-blessings and mega-sized programs and mega-sized hopes and dreams are what fuels the world and counts for success in life. My colleague says in his opinion piece that mega-churches seem to understand that God is found amongst the poor and the lonely because of all the good work they do for the poor and the lonely with their mega-resources. If I may be so blunt: bull. Such romanticizing of mega-sized resources and mega-sized programs for the poor is a mega-sized dream. If it is true that mega-sized churches really did believe God is best found amongst the poor and the lonely, the pastors would lead the charge there by putting the mega-sized buildings up for auction or, as a little church here in Wrigleyville (Chicago) has done, take out the pews and allow the homeless to sleep on the floor during the week. That’s mega-voice with a congregation of 40 on a Sunday morning. Finally, I guess I’ll also say that I don’t like mega-churches because it just feeds the mega-monster in the American (not exclusively, but largely) personality that bigger is better, success is godly, and fancy is freeing. Jesus, who had a large following but just over a dozen main players, who had no job, no home, and by any modern measure of success was, well, not successful, gives me no indication that mega-churches are anything but mega. They are no more church than any other size gathering, no matter how you spin it. And despite my colleague’s parsing of “God in mystery” and “God that repels” as motivating factors for church size, I don’t think the argument for building church empires lies in how people relate to God. By and large I think the truth lies in how people relate to egos, to money, and to what typical “success” is supposed to look like. This is why we have mega-churches: because we like mega for all the wrong reasons. But, lets be honest, I don’t like many small churches, either. Mostly because I usually find that they think they should be mega, and get depressed because they’re not. Or because they say they don’t want to be mega, but secretly do. I like churches who are honest about themselves, who they are, and confident that in God, they can do all they are called to do in this world. Funny. Nothing about Jesus is attractive on paper. This entry was posted in Current Events and tagged Church Insiders, Community, Honesty by Timothy Brown. Bookmark the permalink. Good perspectives. I’ve been in more than one mega-church (no longer) in my time. I don’t think you can have a one size fits all view of it. Some are good. Some are bad. We should expect growth were the gospel is preached (acts 2v41 – now that’s an effective mega church – 3,000 believers, how big was that meeting?!?). But it is easy to loose perspective, esp when the money starts rolling in. Your point on anonymity is excellent, but some people won’t even get taste of the good stuff (I mean the gospel) because they fear the first step into a small church because they’ll be beset by the locals.There are strengths and weaknesses in both – good job in pointing it out. You are absolutely right about that, Clapham. I do think one issue with small churches is that many people aren’t interested in setting foot inside because there’s no place to hide. Seems to be saying the same thing you’re trying to say here. That’s good and fair critique. I should say, I wasn’t trying to make a commentary on the article’s author as a person. Please know that. I only know Clint digitally, not otherwise. And I think the lines you pulled do, in some ways, converge with my main point. But before that particular point, and then again after it, he, I think takes the sting out of what he says there. He had the opportunity to actually speak a little truth to power…and he softened it, I think, because…well…”mega” is strong. Although ecclesially (if you’ll allow that word) I do think his point of “we’re all one big mega church” is correct, in practice it is not. And so, your question, “what does he say and what does he want to say” is a good one. Because I read what was said, and please know, there is good stuff in the article. His point about liturgy is quite valid. But what does he want to say? I don’t know. Because if you hate the mega mentality, but then make statements to reinforce it and fail to make statements to actually challenge it, I think it takes a little push back. And, upon rereading the article (thanks for sending me back…that’s important, too), I guess I’d also say that I really don’t think his analysis is correct. I don’t think mega-churches are mega because they feel mega helps people connect with God better (the God of fascination). I think mega churches are mega, and remain mega, because the critique of “mega” isn’t really being had…it’s been given lip service, and mega is so attractive. I mean, what if churches and congregations and denominations intentionally kept their gatherings “small” (as yet to be defined…much like “mega” is yet to be defined)? Above all else, that is my critique. I like the difference between the God of fascination (which, I think good high liturgy does as well as stadium worship), and the God that repels (which, I think can be done well, too). I like the soft critique of mega that he gives. I just don’t know if he actually means it, and I don’t think he hits at the root of mega…and perhaps that’s not his point. But if you mention it in the title, we should probably talk about it. Nice piece, which I just posted to Facebook. I teach at a Christian university (where all of the faculty are Christian), where perspectives range from very “liberal” like mine to very “conservative.” Some of us attend small churches (in my case a poor downtown UCC church where probably a quarter of the congregation is LGBT), some go to bigger traditional churches (mostly Presbyterian, the same denomination as the school), and some the fancy new mega-church (which seems to be drawing increasing numbers of our students). I actually share many of your concerns, but I also wonder how different today’s mega-churches are from what many older folks knew growing up. After all, my church — which now typically has 75-100 people in the pews on Sundays — apparently had a membership of more than 2,000 in the 1950s. (The first of a series of splits came over Communism, of all things.) I wonder how those old versions of mega-churches dealt with the issues we now see with the new ones. A great question! I wonder that same thing. The ancient gatherings were small by necessity. I wonder if we can be small on purpose. To be fair, not all the ancient gatherings were small. Jesus often spoke to thousands at a time — especially when He offered refreshments, such as bread and fishes. A fair point, Christopher. Jesus did talk to many on a few occasions according to the gospels. “Mega” is less about size, though, and more about mentality. And of course, Jesus never worried about how many were present. He’d talk to a household or a multitude. He certainly never obsessed that his congregation was dwindling. My absolute favourite church was St. John the Baptist Anglican church in Gull Lake, Saskatchewan. We had about 15 people and it was the most Christian congregation I’ve ever been in. I still mourn the fact that since moving I can no longer go (2,000 miles is a long way to go on a Sunday morning). Indeed. And different things for different people. I just think our addiction to Mega is killing the church and the relational quality of Jesus’ message. Please check out Church of the Highlands in Birmingham, Alabama. There is no doubt the Holy Spirit grew this church. It has many campuses throughout Alabama. The church has been invited to have services in all of Alabama’s prisons. They have a Dream Center in one of the poorest parts of town that provides a health clinic and bible studies and more. They partner with social agencies who are doing good work and are getting good results and they help them get even better. They work with other churches that are struggling and provide training for pastors and have a leadership institute. They partner with other churches to start new churches in the United States and all over the world. Jesus started with twelve and christianity grew world wide. There is still much to do. Can a mega church be small? Church of the Highlands offers 2,000 small groups where people can relate one on one and grow spiritually. How does the Senior pastor do it all? He doesn’t. The Holy Spirit does. Check them out…there is much more they do. It’s late and I am I’m getting tired. Amen. Thanks for the note. I know of Church of the Highlands. It’s one of the fastest growing churches in the U.S.